- How can the coach influence the players? In the early eighties the Technical Staff of the Dutch Soccer Association (KNVB), spent a lot of time thinking, studying and practicing, under the leadership of Rinus Michels (national coach), about the youth soccer education in Holland. 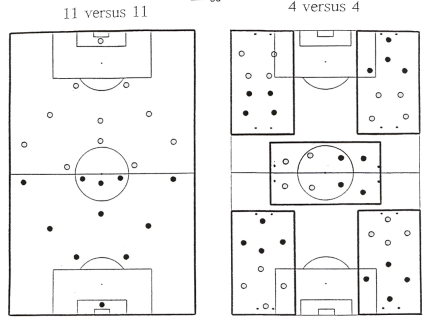 Much time was spent on thinking about the best way to teach children to play soccer. Ideas used from street soccer were the foundations of the development of youth soccer and youth coaching in a modern style. before school, during the breaks, and after school. Every day, 6 or 7 days a week. Time was on their side. There were no adults, parents or coaches, involved in street soccer, except sometimes a bad neighbor or a policeman. 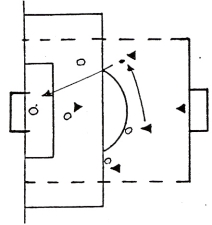 All aspects of the game skill; technique, tactics and fitness developed by playing in simple situations, in which WINNING was very important. most they train two hours a week and play one short match. Naturally there are children who apart from this kick a ball now and then. But it isn't only soccer anymore. Other sports, hobbies and watching TV often take the priority. his father used to do. especially children learn, have brought us to the "Dutch Vision" of soccer, soccer training and soccer coaching for junior and senior players. When players are motivated practicing their sport, they'll learn more from it, and therefore become a better soccer player. So our aim is to get as much pleasure from soccer as possible. From soccer training the most enjoyment can be gained in situations where players can score as much as possible and also have to defend. On a full size pitch children don't have enough touches on the ball and therefore don't learn enough. So we suggest that children up to the age of 11 should play games with smaller sides and on smaller fields. This way they become more in contact with the ball and in match-situation this improves their vision. Repetition is an important aspect in the process of teaching soccer. Practice, practice and practice again. Doing the same thing over and over again, which was in the early days the case in the street. - sufficient balls and goals etc. That's why it is important that coaches understand how children experience soccer and that they know how to make things clear to the children. Teaching soccer, coaching soccer, requires a lot of knowledge and understanding of the game. The "Dutch Vision" on coaching is a method designed to teach the youth in a better way. We are convinced that this is the way to develop better soccer players and to get more enjoyment out of the game. * Because of the number of players there are always possibilities to play deep, wide or backwards. You are always confronted with match situations. The coach must develop and increase the soccer-performance of the players. In youth-soccer up to 11 years old the main objective is to learn the technical skills. 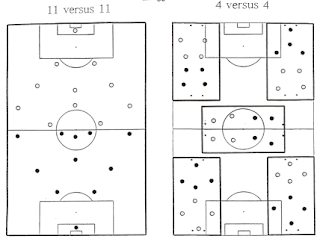 - Development of the tactical aspects of the game. - Playing soccer with a given task. * they must be aware that the most important thing is winning the game. Technical activities should not be considered as the be-all and end-all; The game, maturity as regards playing and matches and matches and pleasure in playing should, generally speaking, be all-important. exercised individually and in a way that is out of context; they are taught as individual 'tricks of the trade'. How can the coach influence the players? - Is there close attention? - Is there atmosphere to perform? - Do the players recognize the situation? - Is the space used optimally? - Do the players understand each other. - Are the players working together? - All the players alert? Technique, insight of the game and communication can be distinguished from each other, but can't be separated. They influence one another and are depending on each other. In youth soccer up to 11 years old mostly the technique can be considered as a shortcoming. In this age-group the coach basically works on the improvement of the technical skills. In the older age-group the emphasis will be focused more to insight and communication. 4. Make the right choice for the correct practice sessions and the correct coaching-remarks, so one can increase the soccer-performance and make their soccer better. A different organization, different sizes of the field and goals, different rules and different ways of scoring give the game another character. These different rules deter other demands for the players. The coach has to recognize the specific character of the game to be able to understand and teach. Size of the field: 40 x 20 meter (or wider). Use cones to mark the goal line. 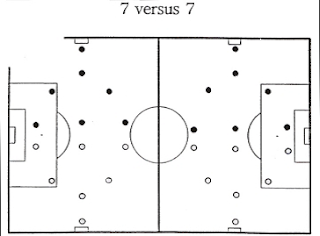 - Creating scoring chances by quickly switching the play from one side of the field to the other. 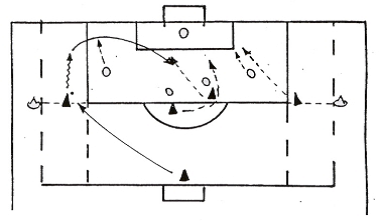 - Wing players have to be alert to receive the ball and go to the goal as quick as possible. been played the ball too hard and he hasn't got it under control. - Mark your opponents tightly and pressure them into making mistakes. - By giving your opponent too much room you will concede a lot of goals. technique is important; this has to be coached). - Defenders must mark tightly, mustn't be beaten, don't be pushed back and eventually block the ball. To be able to win the ball in a tight area in front of your own goal and then with quick break playing one of your team-mates deep to try and score yourselves. - Attacking carefully and with quick positional play in a tight area try to score. - Good ball control, passing, dribbling etc. pass has to come as quickly as possible. GAME Size of the field: 30 x 45/50 meter. Middle line. - Scoring with the head or volley. - Scoring with shot from own half. - Heading is the most important aspect here, for the strikers as well for the defenders. - Shooting from outside of a certain area (minimum distance 16 meters). - High balls for the keeper. - Wing players who have to give a good cross. - Defenders who have to defend. - Strikers who have to score with the head. - Players playing their own positions. - All participants play at the same time. - Finally there will be one individual winner. - Each player has different teammates for five separate matches. - Games are 10 minutes long, using small goals. - Players must find out for themselves on which field they have to play. - Players have to decide their positions amongst themselves. - Players keep track of the scores themselves. - There is no referee. - Children control the rules themselves. - Each player receives 10 points for a win, 5 for a tie and, regardless of wins or losses, 1 point for each goal his team scores. - 5 small fields (20 x 40 meter) on an official field. - Cones/stakes as a goal 2-3 meter wide. - The fields are marked with letters (see pictures). - The fields are indicated in such a way that everyone can see it from a central position. than a second soccer-field has to be used. - At each field there are 5 pinnies or bibs. - The game-schedule is posted in such a way that it is visible and readable to the participants. How to use the schedule? - Count the number of participants. - Figure out how many fields are needed (5 players per team). 5 x B / 5 x C/ 5 x D.
- Further the letters will be filled in a different order in the column "game 2". - After that one has to fill out the same letters in a different order in the column 3" (and so on). - Be aware that the kids have the same age. If there are 40 participants the group can be divided in 2 groups of 20 (fog example). The conclusion is that both groups needs a separate outline. - Use several different color felt-pens to fill in the points and the field schedule. - Make some big copies of the game-schedules. - Before the games start inspect to see if all the teams have the right amount of players. - Use a calculator to add the points. - Use the score-card to note down the final scores of the games. - During the next playing-round the scores can be filled in on the game-schedule. - There is no referee, the children must control the rules themselves. - There is no goalkeeper. - After a goal has been scored the player may dribble or pass the ball from the back line. - In stead of throw-ins the ball is kicked in from the side line. (you can't score). - One can score from any position on the field.